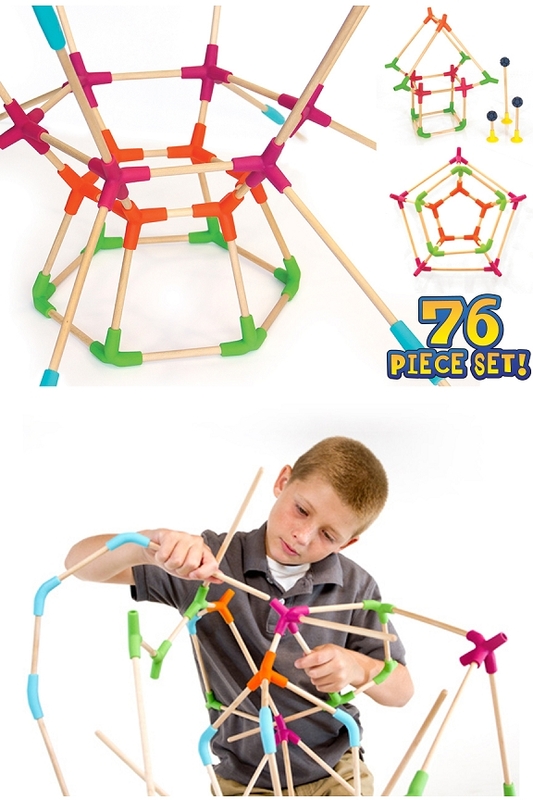 76 Piece Construction Set With Flexible Joints And Natural Wood Connectors. Stuff Points: Earn 45 points when you buy this stuff. Fun to say, but even more fun to play: JOINKS! 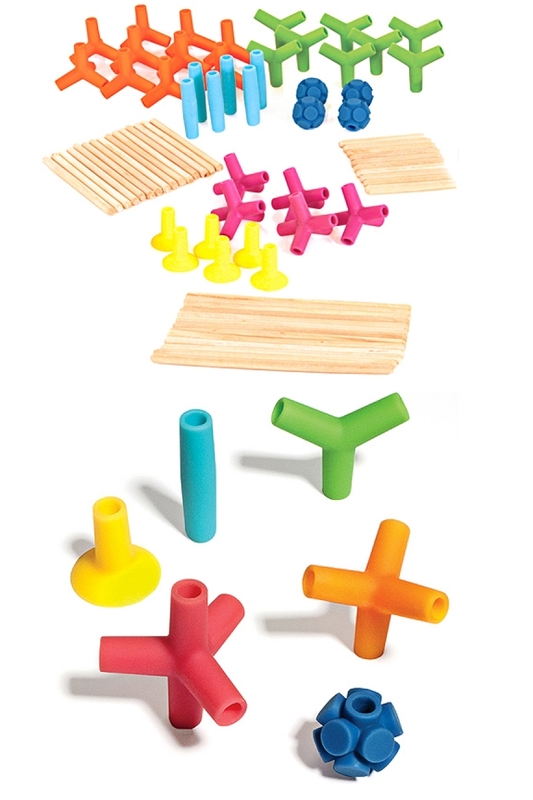 Smooth wooden dowels are paired with a variety of silicone parts for limitless building possibilities. 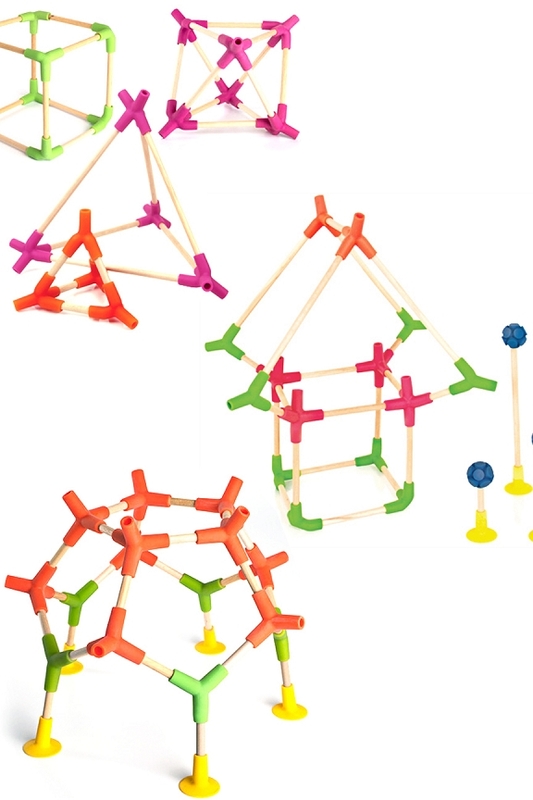 The brightly colored joints are totally flexible, and easy to connect, so any child will build and create with little effort. Just slide the wooden piece into any rubber opening for a simple and secure bond. The parts will remain connected, but they will also be able to twist and bend as needed. Pull them apart, and the tight fit results in a delightful popping sound as they disconnect. Make monsters that walk, wings that flap, or three dimensional shapes that flatten in an instant. Each set includes four types of joints, three sizes of sticks, and two types of end pieces, so there is no limit to what kids can create. With included suction cups, they can even build on walls and windows for some zero gravity construction. There are a total of 76 pieces included so large or small projects can be built using this set. Thanks to effortless combinations, children of all ages will enjoy playing with Joinks. Young ones will pair a piece or two, and giggle as the pop apart, and older ones will construct geometric shapes, or molecular models, as they challenge themselves to discover whats possible. You get 76 pieces in total. The set will include natural wood sticks with a variety of lengths, and end pieces in two varieties. The key to connecting the parts is the flexible joints, and you'll get 28 with a differing number of prongs and angles. See the list below to find out exactly what's included. 4 nubby balls (1 prong). 6 suction cup connectors (1 prong). 4 magenta connectors (5 prongs). 6 teal connectors (2 prongs). 8 green connectors (3 prongs). 10 orange connectors (4 prongs). High Quality. Natural wood and high quality silicone combine to create a toy that is long lasting, and easy to use. Don't settle for cheap plastic that falls apart and frustrates. Get this construction set for guaranteed fun. Easy Connections. No difficult maneuvers, or practice necessary. Simply slide sticks in place for a secure hold. Any child can build quickly and easily with this set. Fun Sounds. The name is fun to say, but they also make a fun noise when you pull them apart. The strong bond created by the silicone results in a pleasant popping sound as the parts disconnect. Flexible. Hard plastic joints limit potential, but the bendable ones that come with this set can twist, turn, flatten and curve to any angle they need. Educational. 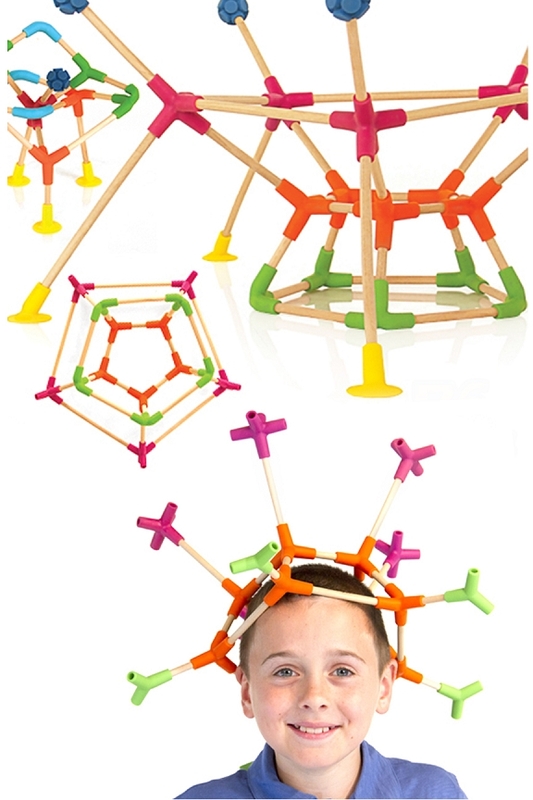 Teach kids about geometry, build molecular models and more. Children will exercise their creativity and problem solving skills while further developing fine motor skills and spacial recognition. Zero Gravity. Included suction cup end pieces allow kids to build on walls, windows and other vertical surfaces. It's enjoyable on any flat table, but children love to discover and explore to see what is possible. Open Ended. Horizontal or vertical. Shapes or creatures. Wearable hats or flattened stacks. With no one way to combine, children will think of their own "right way" to build. Vibrant. The smooth natural wood is complimented by the bright and bold color of the other pieces. Grab their attention, and keep them building all day long. Uses Connect the pieces to build almost anything. Flexible joints bend and twist, but hold securely. With added suction cups it even works on walls and windows. Make creatures that wave, buildings that flex, or geometric shapes that flatten and then re-form. Simple yet amazing pieces let imaginations guide construction, and there are no limits to what children will create. Order Yours Today! Bath Time Fun. Turn Water into a Colorful Goo. A New Branch to the Building Block Family Tree. The Name Says It All. Pop And Rock While Sitting, Standing, Twisting, Wobbling And More. A Finger-Powered, Hand-Held Spinning Game. Addictive And Challenging. A Stacking Toy With A Twist! A Reversible Base Adds To The Fun. High quality, and highly addictive. Spin for fun, or spin to reduce stress and anxiety. Ideal for adults and children alike.